For those of you, that are already convinced of the Brussels sprouts merits, this salad is for you. Yes, a Brussels sprouts salad! One made with toasted hazelnuts, my favorite fall apples, a little red onion, and a tasty dressing made with apple cider vinegar, maple syrup and Dijon mustard. Ooh and let’s not forget Italian parmesan cheese. And this combo works. So many taste sensations. It definitely reaches the sweet, bitter and umami… all in one dish. Yes…as the queen of salads, I am of course always looking for new and interesting ways of enjoying my favorite thing – fresh vegetables! And this salad is no exception. It’s delicious, albeit, I would say this is one for cabbage and Brussels sprouts lovers. Why? Well, this is a coleslaw of sorts which means there is none of that tasty caramelized flavor of oven-roasted Brussels sprouts — which I oh so love — rather its enjoyed pure and unadulterated. That said, I do have the perfect recipe to transform borderline and ho-hum Brussels sprouts eaters. A warm Mediterranean style roasted Brussels sprouts salad. On the fence? Give it a try, you’ll love it. My initial thinking about this salad was… well I love raw kale salads, I love cabbage salads, and although it’s a little more work, I also love Brussels sprouts salads. So high time I create a new recipe for one. And this time, a recipe that could potentially join the Christmas table or any family gathering. The point being, it needs to hold up well — it does and really well — it needs to be seasonal — bingo — and maybe it’s time we change up tradition and simply try this underrated vegetable in a new way — as a salad! So friends, maybe it’s time to give this winter vegetables a second chance. This salad is a delicious way to enjoy raw Brussels sprouts. 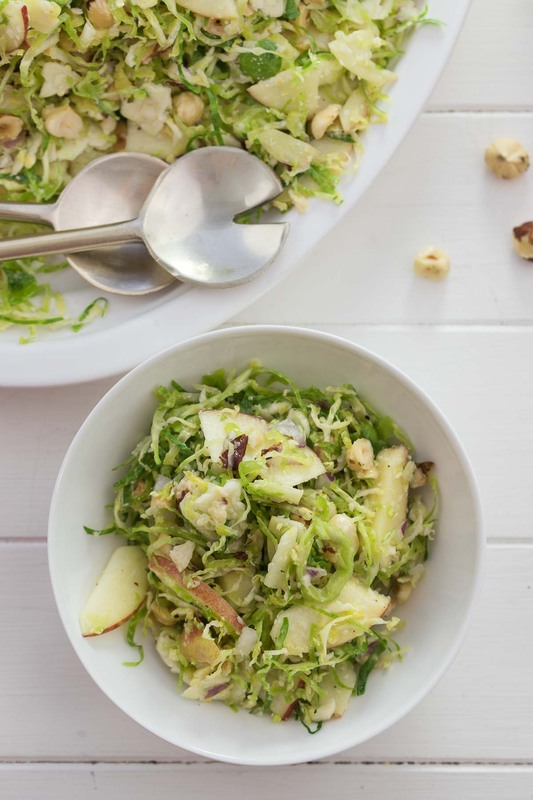 An easy and delicious Brussels sprouts salad. 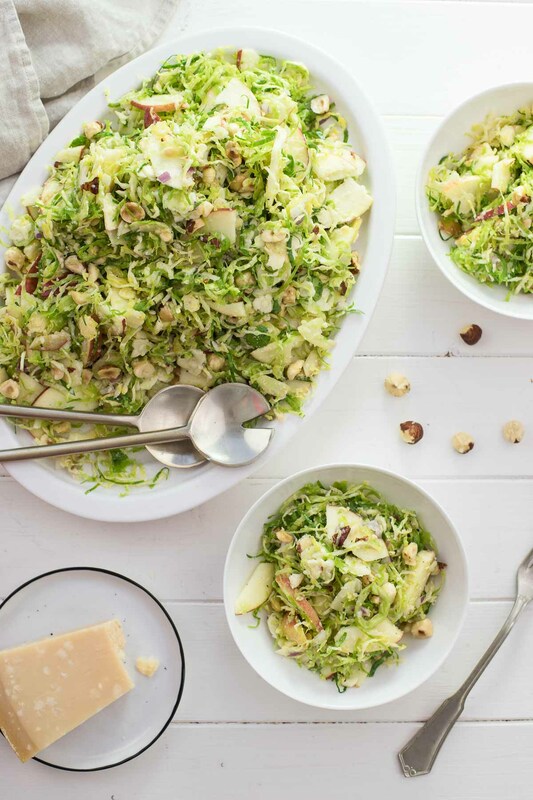 Apples and roasted hazelnuts give the salad a sweet and nutty note, and parmesan the perfect amount of umami. The perfect, healthy winter salad. In a small bowl, mix together the olive oil, apple cider vinegar, maple syrup, and Dijon mustard until well combined. Season with a little salt and pepper, to taste. Transfer the shaved Brussels sprouts to a large serving bowl. Add the apples, and red onion, pour over the dressing and toss until evenly coated. Add the hazelnuts and parmesan and toss again. Check the seasoning and add more salt and pepper, to taste, if desired. I use a mandoline to shred Brussels sprouts. So if you have one, now is the time to break it out (be extra careful and be sure to use the protective holder / safety attachment!). Alternatively, a food processor can be used. How to shred Brussels sprouts without a mandoline or food processor: trim the ends of the sprouts. Then cut them in half. Lay the cut-side-down and finely chop until they are all shredded. 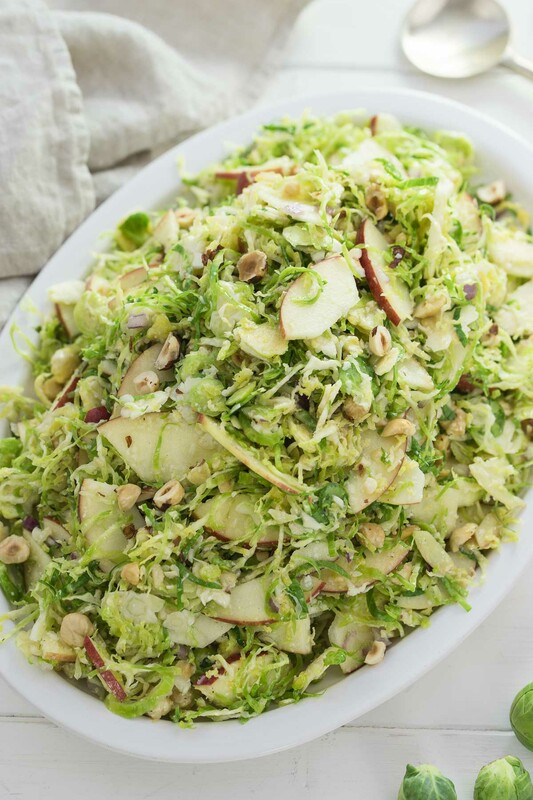 If you make this Brussels Sprouts Salad with Apples & Hazelnuts recipe, I’d love to hear how it turned out for you! Be sure to rate it and leave a comment below to let me know! Especially if you have tips for other readers. Or take a picture and tag me on Instagram @ellerepublic and don’t forget to hashtag #ellerepublic so I don’t miss it!